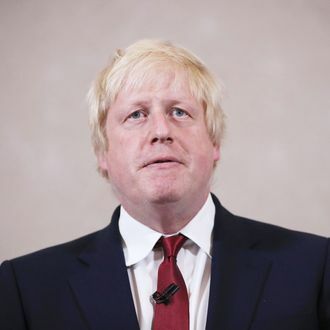 Boris Johnson, the bushy-haired British dog who caught the car last week, will not run to replace David Cameron as the U.K.’s prime minister. Most interpreted Johnson’s decision to forgo that offer as a sign he wanted the job that wasn’t on the table: Running as the leader of a popular — but not too popular — “Leave” campaign, would expand Johnson’s base of support among his party’s Euroskeptic wing, setting him up for a shot at the throne. Now the former mayor has decided that he would rather not clean up this mess. Meanwhile, Johnson’s fellow “Leave” campaigner, justice secretary Michael Gove, announced that he would seek the Tory leadership. Gove had previously insisted that he had no interest in being prime minister. But since last Thursday’s vote, Gove appears to have grown distrustful of Johnson.